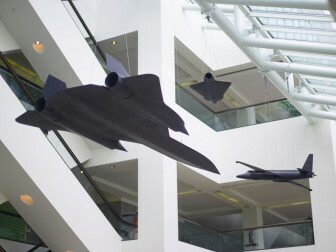 Suspended from the ceiling of the CIA's headquarters in Virginia are reminders of intelligence history: models of the U-2, A-12, and D-21 Drone. These models are exact replicas at one-sixth scale of the real planes. All had photographic capabilities. Citing privacy concerns, legislators throughout the country are increasingly passing laws to restrict the use of domestic drones over private land. For more information on drone use, see the series: "Sunshine Week"
At least nine states have officially enacted some form of legislation that bans nonconsensual domestic drone use over private property, found an analysis by the American Civil Liberties Union, a network of more than 500,000 members who monitor First Amendment and privacy rights. In the states with drone-restriction policies in place, drone pilots surveying land and capturing images need to first gain consent from the owners of the land they are flying over. Likewise, law enforcement authorities need to first secure a warrant. 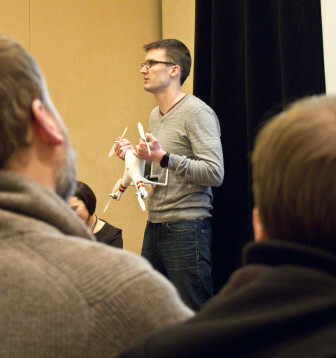 Matt Waite holds a drone while giving a presentation on citizen journalism in Baltimore. Waite is a professor of journalism at the University of Nebraska who teaches a class on the use of drones in journalism. This year, at least 34 additional states have also introduced similar policies that aim to limit domestic drone use. And the moves are widely supported by the agriculture industry. Florida, Idaho, Montana, Oregon, Tennessee, Virginia and North Carolina – a state where policymakers placed a minimum two-year moratorium on drone use – have all already passed drone legislation. Illinois and Texas, two of the top ag-producing states in the country, also recently passed legislation restricting drone use. In 2012, the Illinois agriculture industry sold more than $17.1 billion in farm goods, according to preliminary 2012 Ag Census results. The Texas agriculture industry sold more than $25.4 billion. When Congress reauthorized the Federal Aviation Administration’s budget in 2012, it did so with the stipulation that the administration would expand airspace for unmanned planes by Sept. 30, 2015. “We’re sort of at the brink right now,” said Bohm. When that time comes, unmanned aircraft will have access to the same airspace as piloted aircraft. The University of Alaska, the State of Nevada, New York’s Griffiss International Airport, the North Dakota Department of Commerce, Texas A&M University in Corpus Christi and the Sate of Nevada have all been designated as test partners to see how the change will play out. “We’re going to start seeing more and more drones in the air, particularly come 2015 once the FAA has to open their gates,” Bohm said. 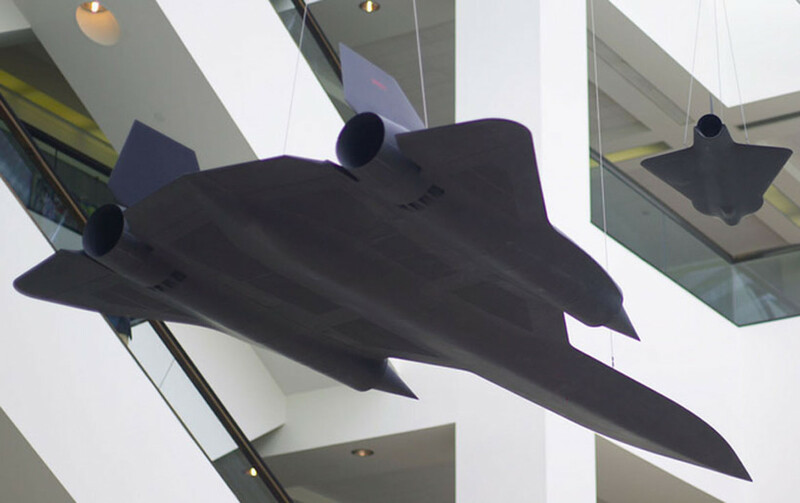 Suspended from the ceiling of the CIA's headquarters in Virginia are reminders of intelligence history: three models of the U-2, A-12, and D-21 Drone. These models are exact replicas at one-sixth scale of the real planes. All three had photographic capabilities. In Illinois, state policymakers approved the Freedom from Drone Surveillance Act, which went into effect in January. The act restricts the use of drones by law enforcement agencies and mandates that an agency may only use drones after first obtaining a search warrant or when there is a high risk of a terrorist attack. “We like to see consent granted, and what we don’t want to occur is for any federal agency to be monitoring farms,” Carney said. In Texas, state policymakers put in place the Texas Privacy Act, which address “images captured by unmanned aircraft and other images and recordings.” It went into effect in September. Pending pieces of legislation are more comprehensive and “thoughtful” than already-enacted policies, Bohm said, mainly because new policies propose regulating incidentally collected surveillance information. “So, saying, ‘You can actually only use the information you collect on the target of this investigation from where you got the warrant,’ rather than saying, ‘Oh, you know I was investigating this thing over here, but I flew over your farm and I think I saw something, and I had a warrant so let me use that,’” Bohm said. Both chambers of the Maine state government recently passed drone legislation, but it was vetoed by the governor. Video: drone hovers above Gifford, Ill.
A drone captures video of wreckage that resulted from a November 2013 tornado in Gifford, Ill. The video is provided by the Professional Society of Drone Journalists. To learn more, visit www.dronejournalism.org. Carney said commercial drones – or drones that individuals employ for certain purposes – present multiple “credible” benefits to farmers, ranchers and other agriculture-industry producers. He also said farmers could use drones to make precise maps of their property and to analyze nitrogen deficiencies in crops. But in all cases, Carney said the key to using drones should be complete and total consent from the landowner. Still, she said all-or-nothing mindsets like Carney’s may infringe upon First Amendment rights. The American Civil Liberties Union maintains the stance that drones should not be used without permission when it comes to the government. In contrast, use on a private and personal level should be acceptable. For instance, Bohm said it should not be all right for a police department to send a drone without a warrant to track the whereabouts of a suspect. Yet, it should be all right for an individual to fly a drone over the New York skyline without first gaining permission from everybody in New York City. Or, it should be legal for a newsroom to deliver a traffic report via drone without first gaining permission from everybody driving on the highway.